McConnell Has $188 Billion Fund to Save Health-Care Bill. How Will He Spend It? The only good news in the CBO “score” of the Senate health-care bill is that it has a lot of excess deficit reduction money that McConnell will use to pick off votes. As Mitch McConnell put Senate action on the Better Care Reconciliation Act on hold Tuesday, he made it clear he intended to keep working on a deal to get to 50 votes, perhaps this week (allowing the Congressional Budget Office to do a quick rescore in time for a vote soon after the July 4 recess). In reality, the timetable is probably what it’s been all along: The bill will come up for a vote if and when the votes are there to pass it. But while it has been a tough week for McConnell — and for his reputation as a legislative wizard — he did obtain one asset that could be critical in the longer run. The CBO “score” of BCRA showed $188 billion in deficit savings above what is required of the bill. In effect, that’s a slush fund for McConnell to use in winning and solidifying Republican votes. How might he “spend” it most judiciously? Nobody, perhaps not even McConnell, knows for sure until the negotiations become white-hot, and any given deal could unravel depending on how CBO rescores the affected language. But here’s an educated guess at how the wily Kentuckian might think about it. Special Treatment for Alaska: The most efficient use of “excess” funds might be to address very specific and relatively narrow concerns of particular importance to senators who are on or near the fence. The most obvious example is Alaska’s Lisa Murkowski, whose state’s health-care system has many unique problems associated with its vast rural areas and its unusual demographics. The odds are very high that Alaska will get its own tidy little pot of money. New Money for Opioid Treatment: The next order of business might well be to throw some serious money at opioid treatment. This is of well-advertised interest to Rob Portman and Shelley Moore Capito, among others. An Easing of the Medicaid Expansion Phase-Out: All of the above-mentioned senators — plus other obvious or potential fence-sitters like Cory Gardner, Jeff Flake, Dean Heller, and Tom Cotton — are from states that took advantage of the Affordable Care Act’s Medicaid expansion option. Slowing the phase-out of that expansion would be expensive, but could lubricate a lot of votes. McConnell’s overall strategy on Medicaid seems to be to make the bill less immediately painful than the House version, while giving conservatives the assurance of long-term “reforms” to the program via a tighter per capita cap on federal Medicaid expenditures. Providing a bit more slack for the expansion to wind down would make sense. Health Savings Accounts for Conservatives: Another expensive (because it would be national in scope) change McConnell could consider might be to dump some money into new incentives for tax-preferred Health Savings Accounts. This is of particular interest to many conservatives — notably Ted Cruz and Mike Lee — whose ultimate vision is of a health-care system where people use HSAs to pay for routine care, and then purchase cheap catastrophic-insurance policies for the really bad stuff. New HSA money could enable these conservatives to say that BCRA, while imperfect, pushes the system in the right direction of a “market-based” approach in which Medicaid withers away and Americans take individual responsibility for the health conditions they can reasonably control. Better-Targeted Tax Credits: A final expensive tweak could make all Republicans feel better about the bill by lowering the CBO estimate of how many people would lose insurance: better tax subsidies for the older and poorer Americans who would do so much worse under BCRA than under the status quo. The Real “Art of the Deal”: McConnell faces the thorny challenge of calculating exactly how to allocate his $188 billion among these different and competing needs. It is important to understand that with the right timing, a little bit of money can go a long way. That was one of the lessons of the House health-care saga: It took only $8 billion in money for high-risk pools — a pittance, given the scope of the problem — to win back the votes of Fred Upton and Billy Long and create the fresh momentum that got the America Health Care Act over the line. 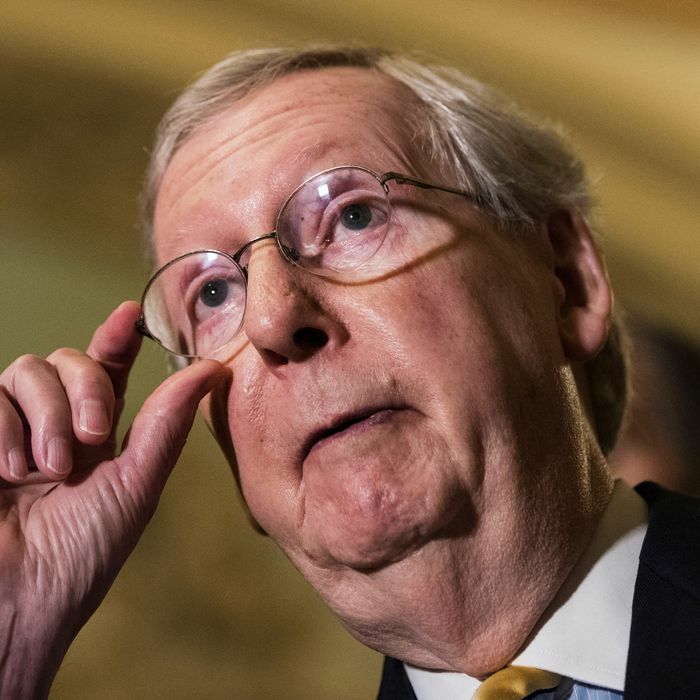 There are some vote-winning sweeteners McConnell could offer that might not have the kind of immediate fiscal implications of the deals outlined above. Conservatives, for example, would be delighted by additions to the list of Obamacare regulations states would be allowed to waive. Some might not be deemed germane by the Senate parliamentarian, and some might boost the already high CBO estimates of insurance losses, but even an insincere gesture by McConnell in that direction might help. And the biggest question is whether there is enough money in McConnell’s slush fund — or indeed, on the planet — to win over the three hardest Senate nuts to crack. Those would be Rand Paul, who, among other things, objects to the very idea of federally supported insurance-purchasing subsidies; Dean Heller, who appears opposed to any bill that does not maintain the ACA’s Medicaid expansion; and Susan Collins, whose reasons for opposing BCRA include all of the “moderate” complaints, plus serious opposition to the bill’s abortion provisions, which are not going to be dropped, no matter what happens. Heller, moreover, is in full reelection panic; he’s generally regarded as the most vulnerable GOP senator facing voters in 2018. And Collins is reportedly mulling a run for governor in Maine, which could place her beyond McConnell’s persuasive powers for good. So McConnell has a tough row to hoe, made worse by the terrible reviews his handiwork has gotten not only from CBO but from the general public. But he’s got a 12-figure sum burning a hole in his pocket, and is undoubtedly about to go on a binge to spend it.